Phew, my little blog has been busy these few days, with xmas releases etc. Do you remember when I was making all the owls for raising funds for the Irish Cancer Society? Well, Nancy sent me ribbons and trims etc to help with the fundraising. She is an amazing woman: always having giveaways etc and being as fair as she can despite huge rises in postage costs in the USA. Well, she brought out a pack of gingerbread trims and I fell in love with it: so much so I felt inspired to say thank you to Nancy in the only way I really can. 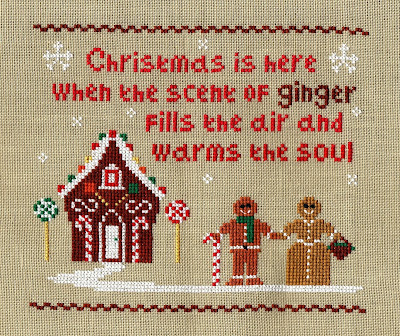 I designed this: The Scent of Ginger. The house etc is stitched in Nancy's Dark Ginger Thread..it was perfect and so easy to seperate and use. I didn't get one single tangle which is unusual for me and overdyed threads! This was stitched on 32 count Belfast Linen (summer khaki) but I am thinking of stitching on 28 count and stitching some of the lace to the bottom of her skirt: there are trims in all three shades of the ginger that I used here. And here it is with one of the buttons from the pack. They look different colours but it got dark here really early and it was hard to take a proper photo. Sorry. The top one is probably truer to the colour scheme as I scanned it but had to use the camera once I had added the button. I am looking forwards to seeing how I can use more of the trims when I work out how I am going to finish it. This chart is available free.....yes, you heard right...FREE from Nancy when you purchase a pack of her ginger trims. I'm not sure yet if it will be via pdf or hard copy. You can also buy the chart from me minus the trims..however, to really get it to look right you should use her thread though I have colour matched to DMC best I could. That's so cute! It's hard to believe Christmas is getting so close already! Thank you from the bottom of my heart. You are such a dear friend.....and I love your new design! Just beautiful Gaynor. 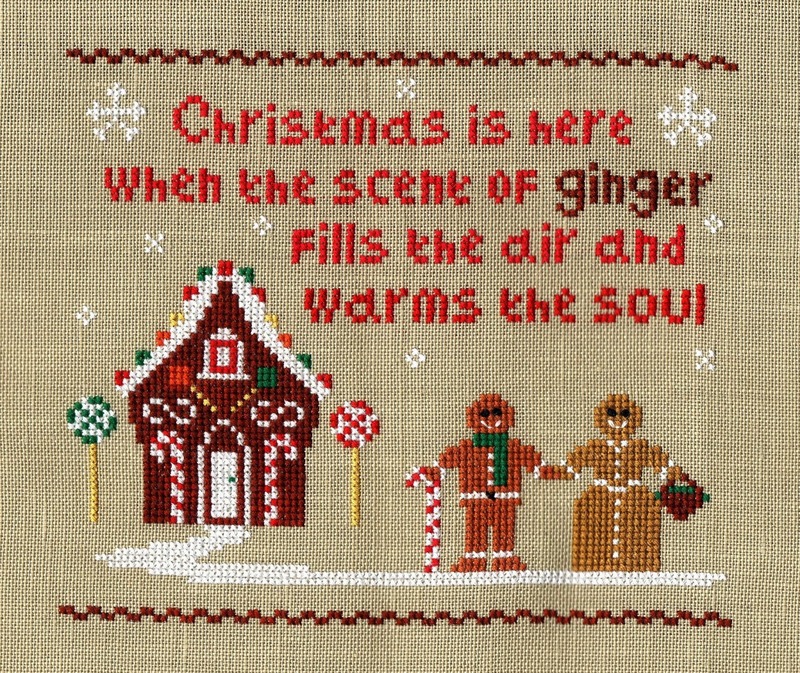 I will give a printed copy of your pattern with each Gingerbread Trims Bag that they purchase. So sweet! You are on a roll with your designing! A great collaboration between your design and Nancy's trims. What a beautiful design, Gaynor.